Make your Slatwall much more efficient with this Chrome 12" Hook for Slatwall. These hooks will maximize the space you have available, which will allow you to utilize your wall space for any type of hanging or packaged merchandise. The 12" reach allows you to add more to your wall displays, keeping them neat and orderly, attracting customers to your wall displays. They will love being able to easily see what they can purchase. In stock and available for immediate shipment. These 12 inch hooks worked great. But the best thing of all was the shipping speed. Order was fulfilled quickly and shipping was basically next day to Dallas!!!!! I have to order more and I'll do it right here. These people want to keep you in business. 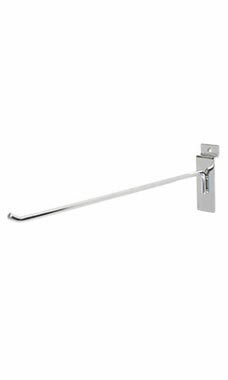 The quality and appearance of these chrome slatwall hooks are impeccable. Sturdy, beautiful and functional. With the fairest prices and lightning fast shipping, how can you ever go wrong! Great price for this item. I have been searching for inexpensive retail items and you are the cheapest everywhere I have searched so far.